The legendary Norman Lear, who produced a spate of groundbreaking sitcoms in the 1970s—shows like All in the Family, Good Times and Maude that had characters talking about the political and social issues of the day in a way we had never seen on television before—hasn’t lost his touch. The new 13-episode One Day at a Time, based on his original series which launched on Netflix this past weekend, is getting rave reviews from television critics, and that’s notable because praise isn’t generally heaped on revivals, which tend to get compared unfavorably to their predecessors. For those of you who have never seen the original One Day at a Time, which ran on CBS from 1975-’84, the show cast the late Bonnie Franklin as Ann Romano, a divorced mother raising her teenage daughters Barbara (Valerie Bertinelli) and Julia (Mackenzie Phillips), in an apartment in Indianapolis. Developed and produced by Lear and created by the husband-and-wife team of Whitney Blake and Allan Manings, the show was controversial at the time because it was centered on a divorced mother, and, like Lear’s other sitcoms, One Day at a Time got laughs while tackling serious issues ranging from teen suicide to birth control. The modern-day version of One Day at a Time has Justina Machado, recognizable from Six Feet Under and Queen of the South, playing Penelope Alvarez, a Cuban-American nurse and military veteran who served in Afghanistan. 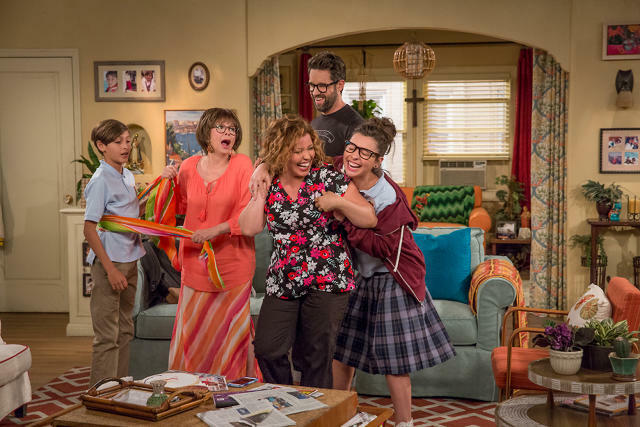 Separated from her husband, she lives in an apartment in Los Angeles where she is raising her teenage daughter Elena (Isabella Gomez) and young son Alex (Marcel Ruiz) with help from her live-in, Cuban-born mother Lydia, played by Rita Moreno. Keeping with Lear tradition, the new sitcom also deals with serious issues, including Penelope’s struggle with PTSD and a shoulder injury that she suffered while on duty (one episode depicts how difficult it is for veterans to get the medical help they need as Penelope tries to get a referral from the Veterans Administration to see a chiropractor), sexism in the workplace (Penelope discovers she makes less than a male nurse at work) and making ends meet in today’s economy. What’s so striking about this reboot is how fresh it is. Visually, it looks like a classic, multi-cam sitcom, and the acting is theatrical in the way you would expect from a Lear sitcom, with the cast playing to the live studio audience gathered to watch each taping. But One Day at a Time doesn’t feel stuck in the past. It is so now, so of the times, and reflective of the challenges many Americans face these days. Being current and talking about the issues that matter right now was a must for the famously liberal Lear, who didn’t want to wallow in nostalgia. “This is an entirely different and original show. As a matter of fact, we didn’t even revisit the old scripts,” Lear tells Co.Create. It was his producing partner Brent Miller’s idea to revive the One Day at a Time concept, and Lear, who was a pioneer in championing racial diversity on television, was enthusiastic about focusing on a Latino family. While the 94-year-old played an active role in crafting the One Day at a Time reboot, contributing to the scripts, helping with casting and being on hand for run-throughs, he trusted showrunners—Gloria Calderón Kellett, whose credits include How I Met Your Mother, Rules of Engagement and Devious Maids and Mike Royce, known for Everyone Loves Raymond and Men of a Certain Age—to build a new show, and he couldn’t be more pleased with the family they constructed. “What Mike and Gloria have rendered here is gloriously warm family, and there is no family of any other stripe, or color, or religion, or anything that can’t relate to it because of our common humanity,” Lear says. “We took the element of the single mother and ran with it,” says Calderón Kellett, whose upbringing as a Cuban-American informs so much of the series. Calderón Kellett recalls how interested Lear was in hearing about her family when they first talked about her working on One Day at a Time. “My parents came over [to the U.S.] in 1962 during Operation Pedro Pan, which was a program that brought Cuban children over while Kennedy was supposed to be getting Castro out of Cuba, and obviously we know what happened there—it didn’t happen,” she says. Moreno’s scene-stealing Lydia is actually based on Calderón Kellett’s mother. “Working with Norman is like working with Willie Wonka because I can say, ‘Oh, it would be so great if Rita Moreno could play my mom,’ and he’s like, ‘Alright, let’s make it happen for you,’ ” Calderón Kellett says. All it took to get Moreno to say yes to the role was a phone call from Lear. He also reached out to Gloria Estefan after Calderón Kellett and Royce told him they wanted her to record a new version of “This Is It,” the original One Day at a Time theme song. “We wanted to do whatever we could to embrace anything from the old show that we could honor,” says Royce of the decision to revamp the theme song. Fans of the original series will notice that the layout of the Alvarez apartment matches that of the Romano apartment, and the apartment number is the same. Dwayne Schneider, the superintendent, is the only character from the original show to join the new series. The late Pat Harrington played the toolbelt-wearing Schneider, who was always busting into the Romano family apartment and sharing his two cents, back in the day. Todd Grinnell portrays a new incarnation of Schneider in the Netflix series. The character is now a trust-fund hipster, who isn’t just the super—he owns the Echo Park building the Alvarez family lives in.